Supporting fun and fitness at work in Los Angeles, Chicago, Manhattan and other major cities. Corporate sports leagues are thriving all over the country for several very good reasons. Corporate sports are so popular that small organizations that cannot field a team are sponsoring teams in leagues. Why are corporate sports leagues so popular? When a company invests in putting a team in a sports league, it is investing in a strong future for its business. Corporate sports leagues become extremely popular when they are combined with the company's wellness programs to promote physical fitness. A more physically fit staff is a healthier staff and that reduces unplanned days off and the need for extended sick time. 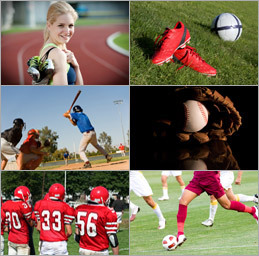 A corporate sports league can also help to keep company health insurance premiums down. Talk to your company's health insurance carrier to see which kinds of corporate sports leagues will help reduce the amount of money your company spends on health insurance. One of the biggest mistakes that company owners can make when it comes to teamwork exercises is they feel that all of these exercises have to be work related. The goal of any teamwork exercise is to get your staff working more efficiently as a unit, and corporate sports leagues accomplish that goal very nicely. When your employees get involved in a corporate sports league together, they learn how to work together outside of the office, and this enhances the teamwork that is done at work. Sports have a way of getting people to learn how to work more efficiently together and that becomes a great asset to your company. Your employees learn how to communicate without verbally saying anything to each other and they also learn how to anticipate each other's decisions as well. Staff members who get involved in corporate sports are put into pressure situations together and that can only help to enhance their social bonds. A good manager knows that employees do not need to like each other at a personal level to be able to work together, but it certainly does not hurt to encourage positive social interaction among your employees. A corporate sports league can help employees to earn a new kind of respect for each other and it also helps them to feel a social bond that cannot be accomplished any other way. That is why a company needs to track the popularity of corporate sports leagues and open up more spots when the staff express a growing interest. One of the underlying positive benefits of a corporate sports league is that it creates a stronger sense of staff loyalty towards the company. This is especially true when the company invests a few dollars in the kinds of equipment the team needs to be successful. A company that sustains the culture of a winning corporate sports team will find that winning culture spilling over into the daily work routine as well. A successful corporate sports team has benefits in other areas such as recruiting, morale, and retaining employees. Investing in a strong corporate sports program will encourage employees to have a strong sense of pride in the company and that can save the company thousands of dollars that would normally be lost to employee turnover. A strong corporate sports program that has strong participation will help to bring together staff members that may not come into contact with each other under normal circumstances. It can encourage employees to develop a high level of respect for each other and create a sense of unity among the staff. If done properly, a corporate sports league can also help enhance the standing of your managers as leaders. Company managers who get involved in the staff sports programs can assume positions of leadership and help to enhance the notion that the company management is a strong team of leaders. A corporate sports league can be a great investment for your company in so many ways. Your staff can learn the value of teamwork and apply that teamwork to settings other than the office. When you enhance the strength of company leadership and teamwork outside of the office, it only makes the teamwork in the office that much stronger. There are financial, physical, and operational advantages to a corporate sports league that only get better when the company invests in creating a winning atmosphere. A company can encourage its employees to have fun in a social setting while increasing staff productivity in the office. Any company that is looking for that missing piece in its staff development puzzle will find that a strong corporate sports environment is just what the doctor ordered.